Google is a household name today the world over for the reputation it has built bringing in novel ideas and applications that are quite user friendly; the name spells magic in the field of various internet related applications. However Google has come out with solutions relating to home energy systems too! Yes; its product PowerMeter Google bears ample testimony to its noteworthy presence in the area of home energy systems. Such a large customer base, Google has built can well be exploited by it to make a grand entry into any field where customers are in need of innovative gadgets and appliances. There is no doubt that integrated technology is the key when it comes to picking various gadgets for carrying out multifarious functions in modern homes. This is where the enormous base of loyal users who consider Google as the panacea for solving any issues they face comes in handy to lap up Google’s innovations. 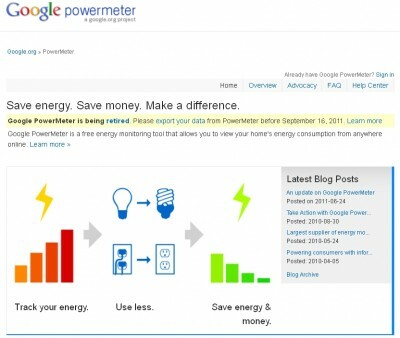 Google PowerMeter is, in fact, an API or software tool that links measuring domestic power consumption to your computer. It thus certainly makes keeping a tab on power consumption at home or office on an ongoing basis a reliable reality. Once, consumption has been linked to your computer, the day is not far when you will access the meter reading with your web enabled mobile phone anytime from wherever you are. Doesn’t it sound magical? A Smart Meter or electrical device first needs to be installed at your home; this is meant to provide real-time info about the power consumption to the Google PowerMeter device. You can thus keep yourself abreast with the actual usage all the time. At the moment, there are not many countries that possess the technical resource to bring in integration of smart metering; but a lot many of them are already seeking ways and means to provide it at the earliest. Google is already testing the process in association with utility services in United States, Canada, the United Kingdom, Germany and India. The concept has enormous potential. To start with, utility companies are being given free access to the application and the power consumers too are not being charged a penny. The application is enabled to be used with existing power monitors. Those of you who do not have a Smart Meter installed at your homes, you can easily find devices for electrical monitoring that can be tagged on to the supply cable without any modification to the existing electrical circuitry. The power consumption data is transmitted by these devices in real time that can be read by you. The fact that by using the PowerMeter Google application you can access the power consumption at your home on a continuous basis is so very unique; that too in real time! Of course, this means that you get a reliable assessment of the electrical gadgets installed at home that draw higher power. Cost of power has already gone up substantially and this can be reduced by shifting the usage of gadgets to non-peak hours by studying the consumption pattern.